Due to an unstable security situation in Ethiopia the last months, and with a state of emergency still in place, we realized we needed to make plans for a new adventure in Africa. 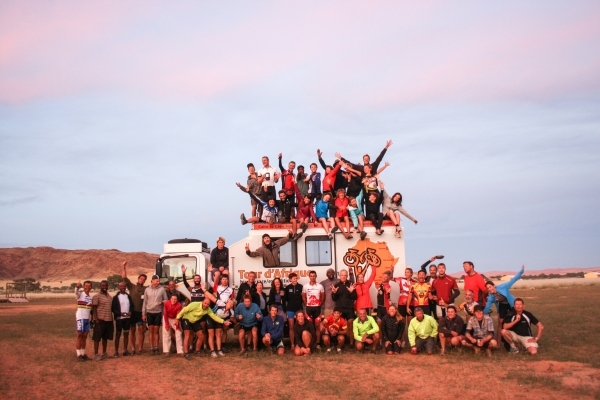 Our 15th anniversary Tour d’Afrique was already destined to be a special year. We wanted to share the top 5 reasons why the new route should prove to be a worthy alternative to Ethiopia. Heading west, we will pass by Lake Naivasha (pictured above) and Lake Nakuru. 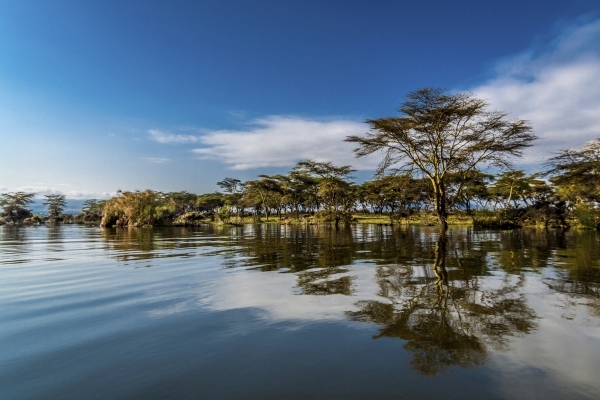 Lake Naivasha is home to over 400 species of birds and a large hippo population. If that doesn’t satisfy your wildlife impulses than stop at Lake Nakuru near the next days lunch stop and view the thousands of flamingos that line the shores. From there, we cycle to Kisumu near the border with Uganda and get our first views of Lake Victoria – Africa’s largest lake. 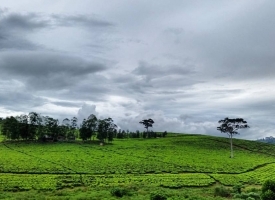 Uganda, once called the Jewel of Africa by Winston Churchill and the Pearl of Africa by others, is gorgeous and green, hilly and hot. 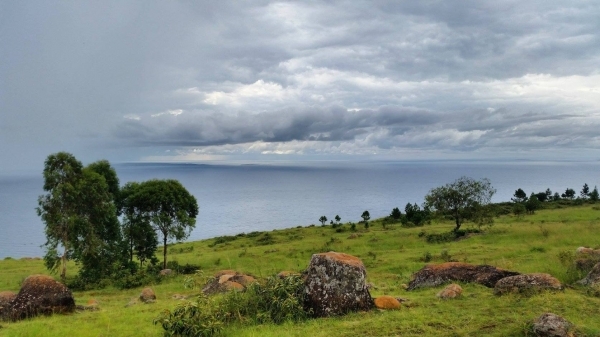 Our route will follow near or along the shores of Lake Victoria and reach Jinja – known as the source of the While Nile. From there we head towards Kampala – known for its traffic. To solve this we decided to access the city by boat. After cycling the friendly villages on the shores of Lake Victoria, we will board a local fisherman’s boat and be transported into Uganda’s bustling capital and largest city. This tiny country has gone through an enormous regeneration in the last two decades. Known as the “Land of a Thousand Hills” the excellent asphalt road network make the challenge of the constant hills more manageable. It’s capital, Kigali, is modern and booming. With two rest days in Kigali, you will have time to visit the famed mountain gorillas. Kigali is where you can pick up your gorilla trekking permit (if you pre-arranged this) and head up to Musanze by bus (buses in Rwanda leave on time and drive the speed limit – quite a treat!). 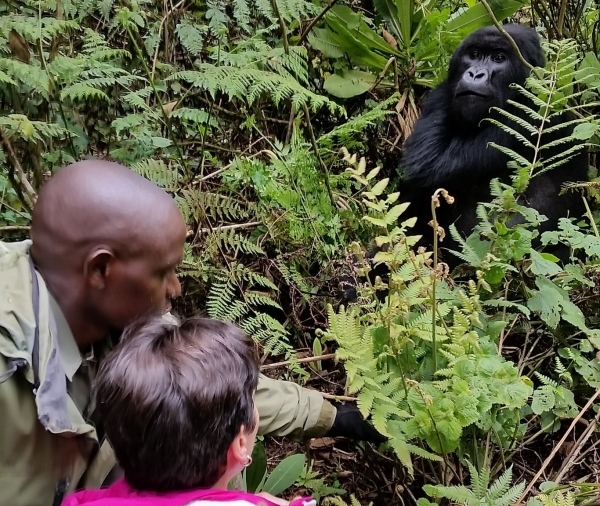 From Musanze you trek into the foothills of the stunning Volcanoes National Park, walking on thick layers of jungle undergrowth – sometimes a meter thick – you will soon come upon a family of gorillas. They spend most of their days lounging, play-fighting, and eating thistles, stinging nettle, and other tasty vegetarian specialties. Your trackers will give you strict instructions to not approach the gorillas within 7 meters, but the gorillas will go where they please, walking past you on their way to another plant to chew on they barely acknowledge your presence – its an incredible opportunity to observe these serene and docile creatures up close. After leaving Rwanda, we cycle through lightly travelled areas of northwest Tanzania between protected areas of various game reserves. We reach Mwanza, Tanzania’s second largest city set on Lake Victoria’s shore, surrounded by hills strewn with enormous boulders. The next day we cycle to Speke Bay named after the explorer who searched for the source of the Nile River. 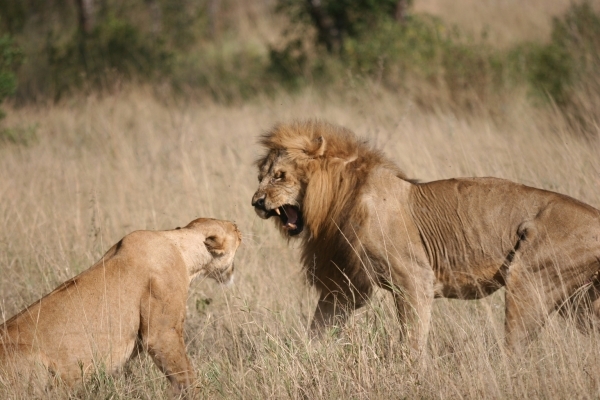 Included in the price for the new Safari Time section is a 3 day safari into the Serengetti and Ngorongoro Crater – two world class parks to observe ‘the Big 5’ in some of the most beautiful and diverse wildlife habitats. When we put our heads together and come up with new routes and new plans, we are at our best. TDA is made up of a team of adventurous and well travelled people who love a new challenge and an opportunity to bring our cyclists to new and exciting destinations for cycle touring. Our cyclists come to us because they trust our instincts, and know that when we try a new route we don’t do it without alot of research, and consultation to ensure it is equally enjoyable and safe for everyone. 2 comments for "5 Reasons We Are Excited about the New African Route (and Why You Should be Too)"
It’s not clear from this where the route from Khartoum to Nairobi goes. This would have to be through South Sudan, surely? Reports are of graver security issues there than in Ethiopia. The latter has not attracted much attention in the international press, but does have an established reputation for low level harassment of overland travellers. Is the real reason reluctance by Ethiopian officials to issue visas for the whole team? If going to Uganda and Rwanda from Khartoum, Nairobi is a >1,000km detour, so it’s also rather unclear why this is planned, other than the popular tourist destinations in Kenya. These are well worth visiting I know (DOI: brought up in Kenya), but those in Uganda and Rwanda arguably more unusual and exiting. Thanks for the note and sorry if it wasn’t clear. The participants will be flying over Ethiopia from Khartoum to Nairobi. So they will not be cycling in South Sudan which, as you rightly point out, would not be a safe option. The tour never travels via South Sudan even on years where we do go to Ethiopia. Once they arrive to Nairobi, they will be well ahead of the originally intended schedule. So to fill that time, we created this exciting new route thru Uganda and Rwanda – it is nearly a complete loop – starting in Nairobi and ending in Arusha. We have timed it so that when they arrive back to Arusha, they are also back on schedule – so the tour will still arrive to Cape Town as initially planned for May 13. Leave a comment for "5 Reasons We Are Excited about the New African Route (and Why You Should be Too)" by visiting the original post on our TDA Global Cycling blog.